EURUSD broke below 1.1390 support, suggesting that consolidation for the uptrend from 1.1176 is underway. 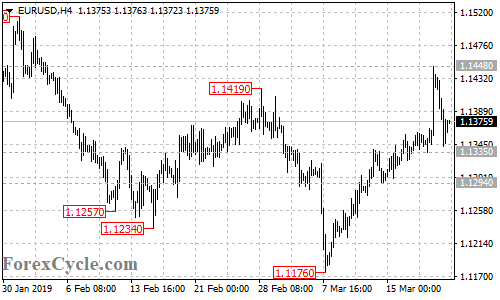 Range trading between 1.1335 and 1.1448 would likely be seen in the coming days. As long as 1.1335 support holds, the upside movement could be expected to resume, another rise towards 1.1500 is still possible after the consolidation. Only a breakdown below 1.1335 support could signal completion of the uptrend.